Our climate is changing, and it seems like extremes are no longer extremes-they are now the norm. Instead of three weeks without measurable rainfall in Seattle, we now go for three months. Gardening in an era of climate uncertainty is challenging. Although you can't control the weather, employing responsible practices when confronting periods of drought will make your garden, as well as our planet, healthier. A good place to begin your quest is by visiting the Great Plant Picks website. This website lists the best plants for the maritime Northwest arranged in categories such as sun, shade, deer resistant, etc. If your goal is to minimize watering needs, you should study the following lists: "Dappled Shade & Drought Tolerant," "Deep Shade & Drought Tolerant," and "Fun in the Sun-Drought Tolerant Plants for Sun." The website defines "drought-tolerant" plants as those needing "supplemental water about once a month during the dry season," except for a plant's first two years in the ground, when it is still getting established and will need regular watering during dry periods. This means that if a plant on the drought-tolerant list is planted in June of 2018, you will need to monitor its water needs regularly throughout this summer and the summer of 2019. By 2020, however, you should only need to water it once a month during the dry season. Every type of plant you might want for your garden is on these lists-trees, shrubs, conifers, perennials, grasses, ferns, vines, and bulbs. 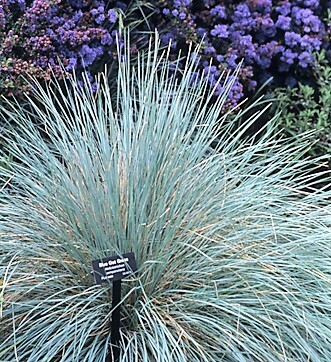 Interestingly, many of these plants perform well with little water in sun or shade. You can design an entire garden bed--or even an entire garden!-by selecting plants from these lists. And you can sleep soundly at night, knowing your beautiful garden is using our earth's most precious resource wisely. Full sun.- For a petite garden bed in full sun, several fine crabapples are among the trees that will thrive with minimal water. In May, Cutleaf Crabapple (Malus transitoria 'Golden Raindrops') is covered in dainty white blossoms that evolve into tiny golden apples ("golden raindrops"). Add a small conifer for contrast. 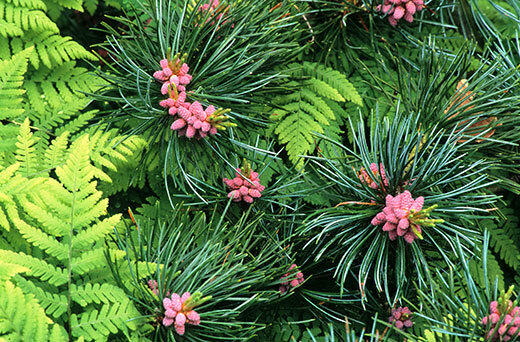 Conifers come in all shapes and sizes and add texture and interesting forms to any landscape. Among those that would complement your crabapple is Blue Japanese White Pine ( Pinus parviflora 'Glauca'). 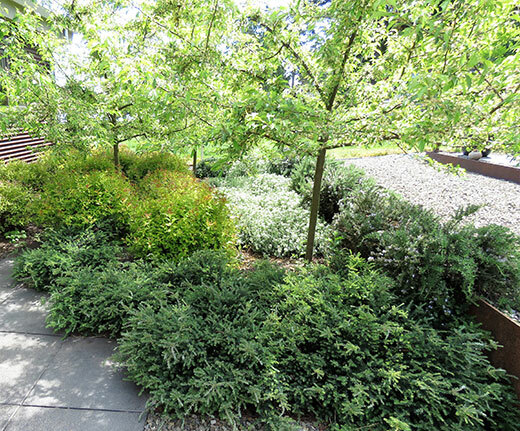 There is a long list of evergreen and deciduous shrubs that thrive in sun on little water. 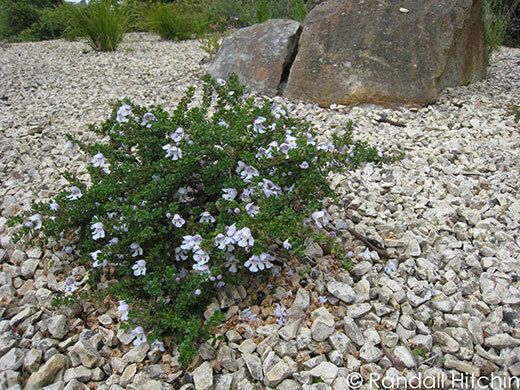 Alpine Bush Mint ( Prostanthera cuneata) is a drought-tolerant, sun-loving evergreen shrub that reaches only 1.5 feet tall, providing a contrast in scale to the larger plants. 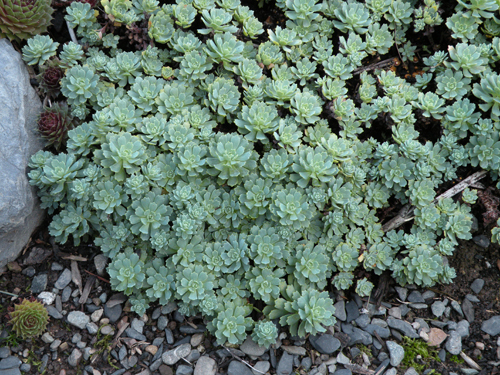 You can round out your sunny border with drifts of Blue Oat Grass (Helictotrichon sempervirens) edged with Afghani Sedum ( Sedum pachyclados). Light shade.- Light shade might apply to an area that gets four to six hours of sun daily, such as an east-facing bed that gets sun only early in the day. 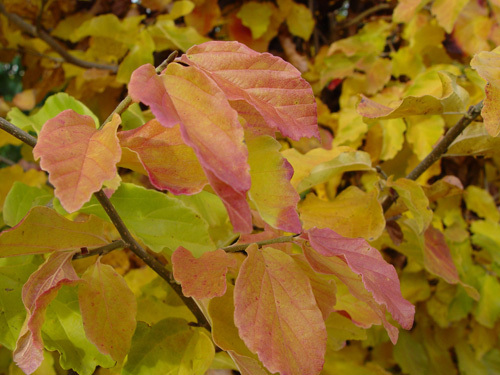 A splendid drought-tolerant tree for light to dappled shade is Persian Ironwood (Parrotia persica 'Vanessa'), a deciduous tree with four-season interest owing to its exceptional foliage, branch structure, and bark. Reaching only 15 feet tall after 10 years, Persian Ironwood also adapts to full-sun conditions. A good contrast for the ironwood would be Hinoki Cypress (Chamaecyparis obtusa 'Gracilis'), a narrow conifer with dark screen scale-like foliage arranged in elegant tiers around the main trunk. 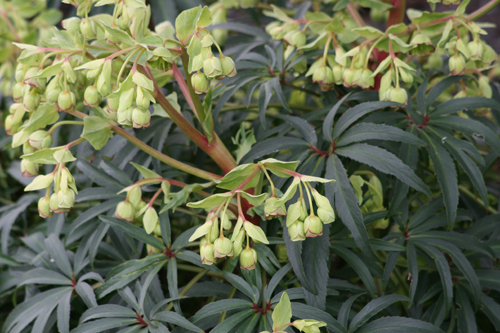 Add in Bear's Breeches (Acanthus spinosus) for its dramatically large spiny leaves and tall flower stalks, then complete the understory planting with Stinking Hellebore (Helleborus foetidus). Deep shade.-- Vine Maple (Acer circinatum) is a versatile small tree that can handle full sun to deep shade. 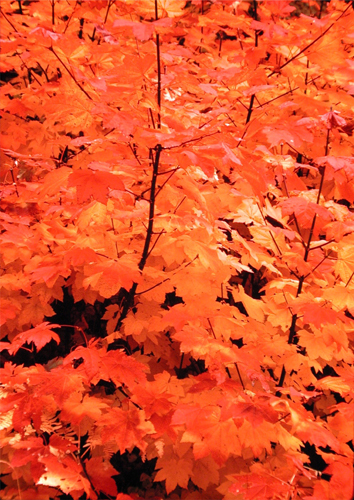 It has many of the attributes of Japanese maple (Acer palmatum), to which the native Vine Maple is closely related, including stunning fall foliage. 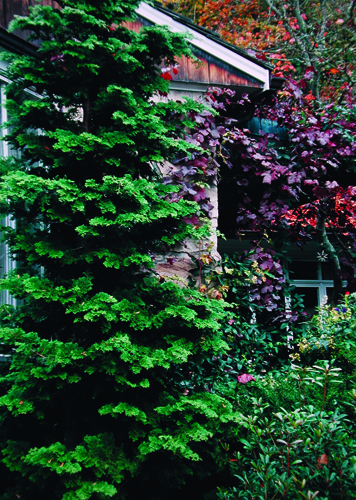 Balance the airy maple with a dense evergreen, such as California Wax Myrtle ( Morella californica). It makes an excellent screening or background plant, and its large size is easily controlled by pruning or shearing. The black berries that persist into winter are a magnet for warblers and other small songbirds. 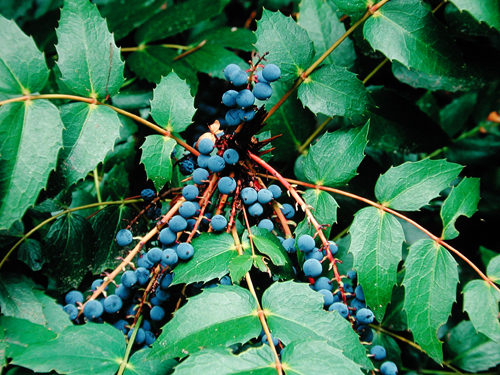 A good drought-tolerant shrub for deep shade is native Low Oregon Grape (Mahonia nervosa). 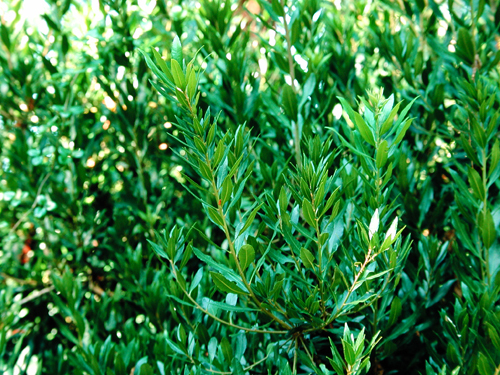 Although classified as a shrub, this diminutive evergreen is more aptly considered a groundcover. 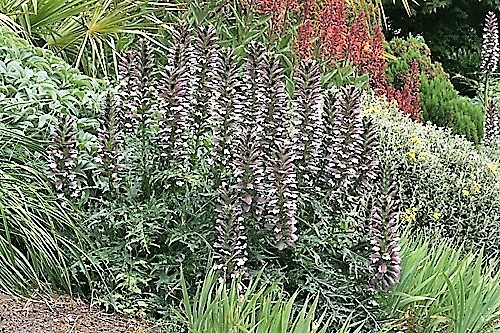 Slow to establish, it will eventually spread to cover the ground beneath shrubs and trees. 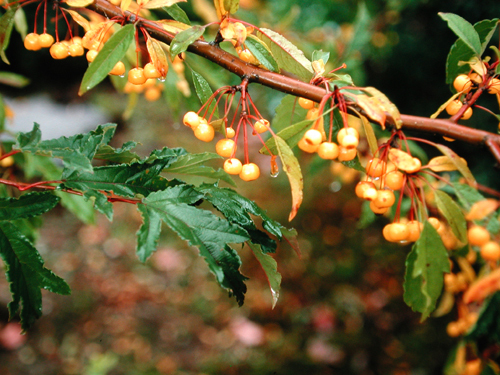 Its long, leathery leaves, panicles of bright yellow flowers, and dangling clusters of grape-like berries are shown to best effect in a shady spot. 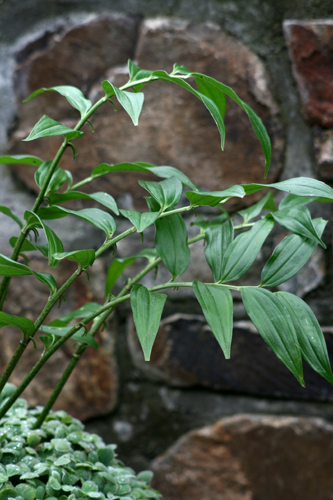 Punctuate the planting with Evergreen Solomon's Seal (Disporopsis pernyi), whose dark green stems should rise above the low, arching leaves of the Oregon grape. Drip irrigation technology has evolved dramatically in recent years, as has the expertise of many irrigation contractors. It has vastly improved over the soaker hoses of yesteryear. Drippers permanently welded to the wall of flexible polyethylene tubing slowly emit specified amounts of water directly to the plant's root zone, resulting in minimal loss of water to runoff and evaporation, as well as uniform application to plants. Drip tubes can even be used to water lawns, with tubing arranged in a grid six inches below the top of the lawn surface. This type of system can be installed by a homeowner, but it is complicated, and consulting a landscape professional might save time-and even dollars-in the long run. 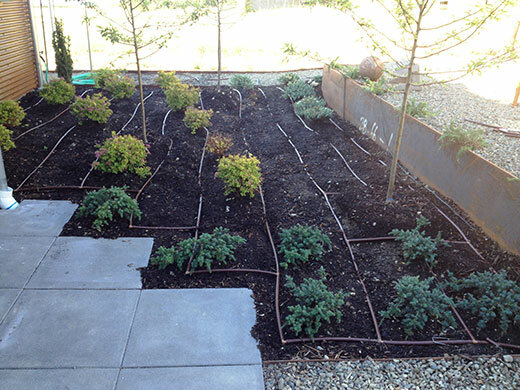 Grid of flexible polyethylene tubing with drippers in wall provides uniform irrigation with minimal evaporation and runoff, shown at time of installation and after three years (images courtesy of Janine Anderson). Two to three inches of mulch applied to the surface of the soil helps hold in moisture, thus reducing irrigation needs. The mulch also protects plant roots from heat, cold, and drought; and helps hold soil in place, reducing erosion. Several types of mulches can be used. One is compost, which is created by the breakdown of organic matter such as dairy manure and grass clippings. Over time, the addition of organic compost improves a soil's texture and fertility. Arborist wood chips are very effective mulches, and they are often available at no charge from area tree companies. Arborist chips are a mix of bark, wood, and often leaves that together create a healthier soil community than is possible from other products, such as finely shredded bark. As with compost and other mulches, wood chips should be kept away from the trunks of woody plants to prevent decay resulting from moisture build-up around the base of the plant. The Saving Water Partnership, an alliance including Seattle Public Utilities and other participating water utilities, has created a "Smart Watering" guide that offers practical tips on efficient irrigation, as well as other advice on gardening with water conservation in mind. Landscape designers and other qualified landscapes professionals also can assist you in creating a beautiful, healthy, and guilt-free landscape.